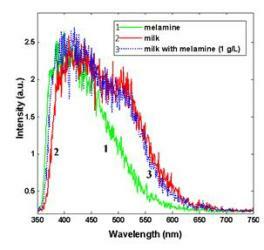 Neural network based photoluminescence test on melamine contamination in milk is proposed. Demonstrated method does not requite specific chemical reagents and costly laboratory equipments. Despite the quite similar emission spectra of milk with and without melamine, neural networks learn to select information from initial noised photoluminescence spectra and recognize melamine at concentration from 0.02 to 6 g/L in milk with up to 99% accuracy. Proposed neural networks-based sensor is promising tool for future home and factory monitoring of melamine content in dairy products.